The CD103 antigen was originally described as the human mucosal antigen 1 (HML-1) and was subsequently proved to be the integrin αE subunit. CD103 is composed of a 150 kDa chain associated with a 25 kDa chain by a disulfide bond. It is expressed as a heterodimer in association with the integrin β7 chain. CD103 is expressed on mucosa-associated T lymphocytes and activated cells. This human intra-epithelial lymphocyte marker is expressed in very few resting peripheral blood lymphocytes. αEβ7 binds to E-cadherin on epithelial cells. 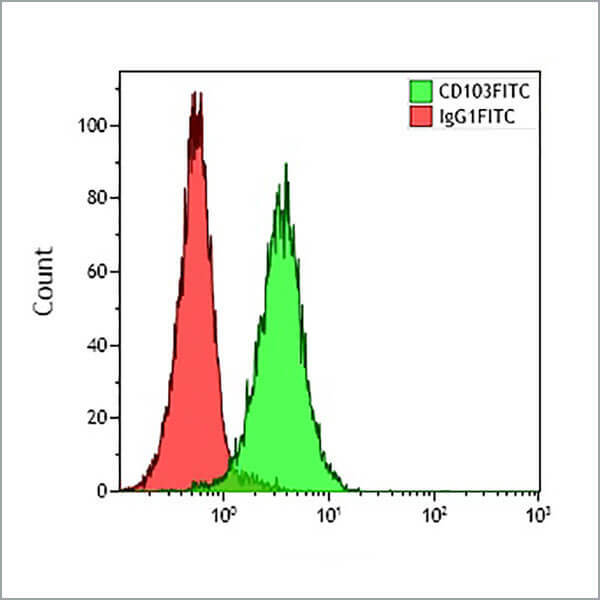 Activation and TGFβ-1 induce CD103 expression. Clone Description The 2G5 antibody stains a few bone marrow cells and, rarely, peripheral blood lymphocytes.